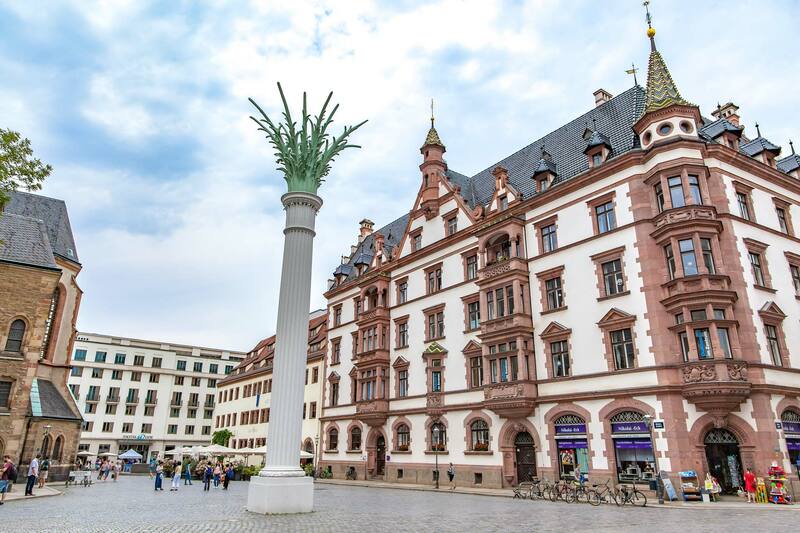 The Cultural Heart of Germany consists of two regions: Thuringia and Saxony, and from historic castles to ornate architecture and galleries, the range of the arts here are truly inspiring. If you haven’t already read my guide to exploring Thuringia from Erfurt or how to spend a long weekend in Dresden and Saxony, check those out first. 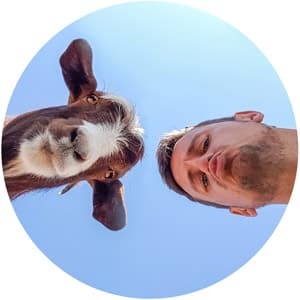 But in this post, I’m going to take you on a tour through both regions and share all of the amazing architecture, culture, events and galleries that are on offer through both regions. While I spent a week exploring I’d highly suggest spending no less than 10-days travelling from Gotha to the countryside of Saxony so you can do so at a relaxed pace. Train travel is quick and convenient here, but if you do want to get that little more off the beaten path, then a car hire will allow you to do so. 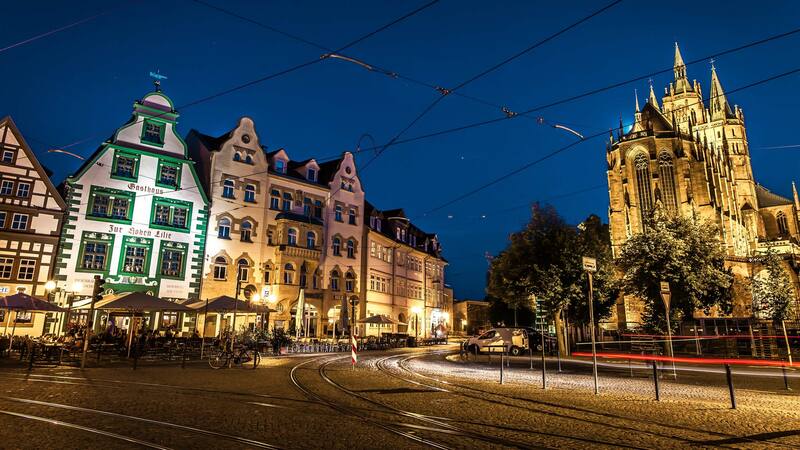 Flying into Frankfurt, Leipzig or Berlin from the UK offers quick train connections, while other countries may offer direct flights to Erfurt or Dresden. The new high-speed rail link from Munich or Nuremberg, providing journey times of between one to two hours, provides another alternative to access Thuringia or Saxony with ease. 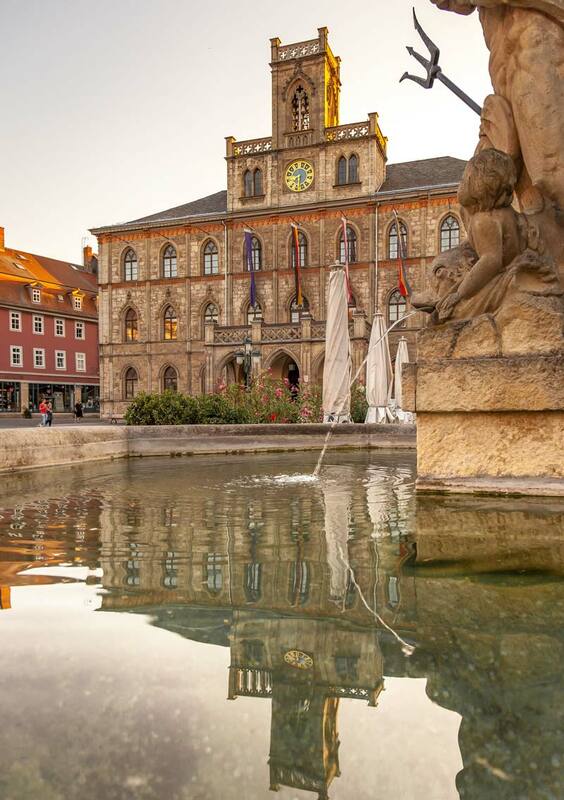 My journey started in Gotha, a small city with a colourful and quaint market square. 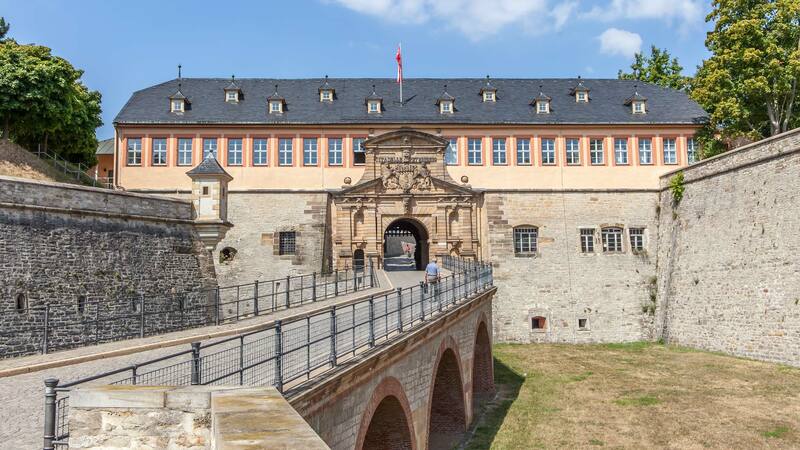 But the cultural interest here is in the royal-residence as it was home to the dukes of Saxe-Gotha-Altenburg and has strong links to the British royal family. Set amongst the English Garden in a city that was aptly once called the ‘garden city’ is the Ducal Museum. The extensive parks around here and the castle offers a wealth of green spots to relax in, including the orangery and the English Garden, one of the oldest landscaped in the English style in the continent. 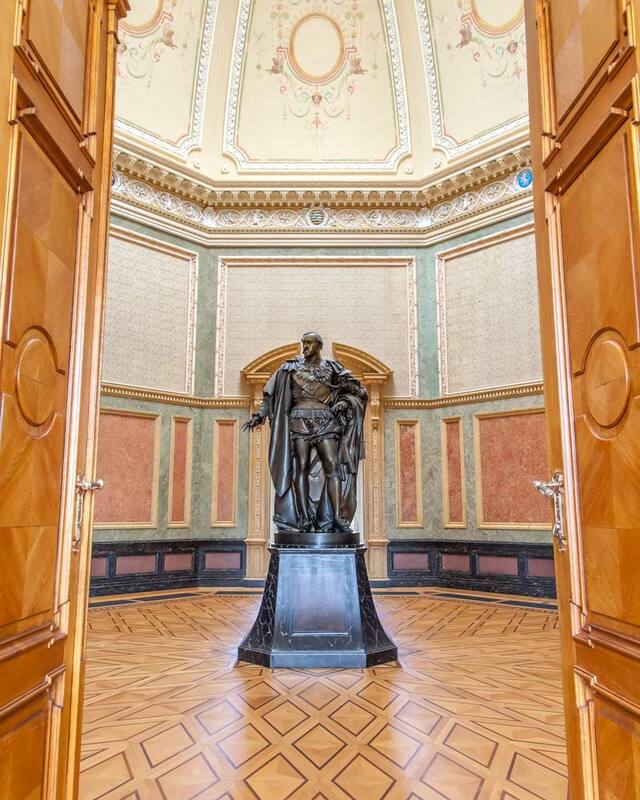 Inside the museum itself, you’ll find a whole host of art and displays but the building, in a grand neo-renaissance style is equally as impressive. 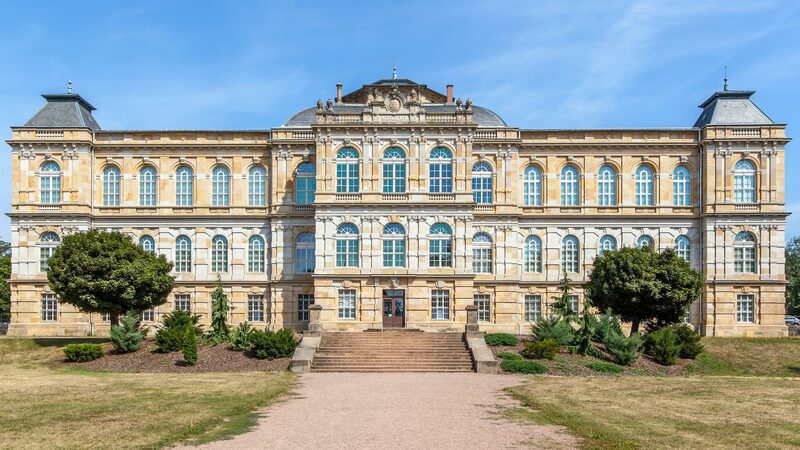 The collection is vast, and although it suffered losses during WWII, the renovations are now complete and the three-storey museum packs in a range of paintings, sculpture and drawings from the likes or C. D Friedrich and Houdon. The collection of rare Asian fans, Egyptian antiques and Meissen Porcelain add an international touch to the museum. 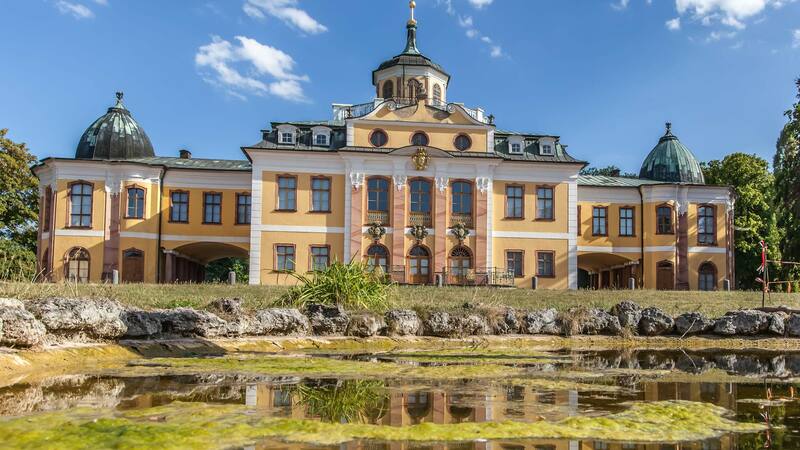 The Friedenstein Castle which sands in view of the Ducal Museum is the largest early Baroque castle in the whole country, and although the outside isn’t overly ornate, inside there is a whole host of treats to discover. 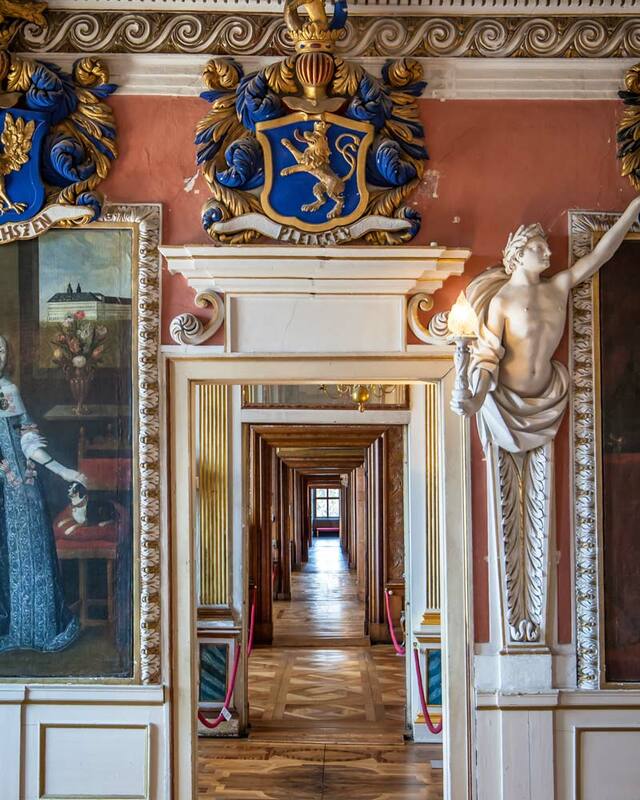 The royal residence sits on the hill above the Old Town and has numerous rooms inside which are well preserved. With the decoration of each room being different and many elaborate, the well-placed art pieces and sculptures can easily be missed as you will be in awe of the architecture. One of the hidden gems inside the castle is a still working and open to the public theatre. The Ekhof Theatre boasts the title of being the oldest, still operating castle theatre in the world and unbelievable the machinery which powers the sets is still working now even though it was constructed in the 17th century. By far my favourite stop during my whirlwind trip through Germany was Erfurt. This city really could have been picked up from a fairytale movie, but there is a lot more going on here than great Instagram opportunities. 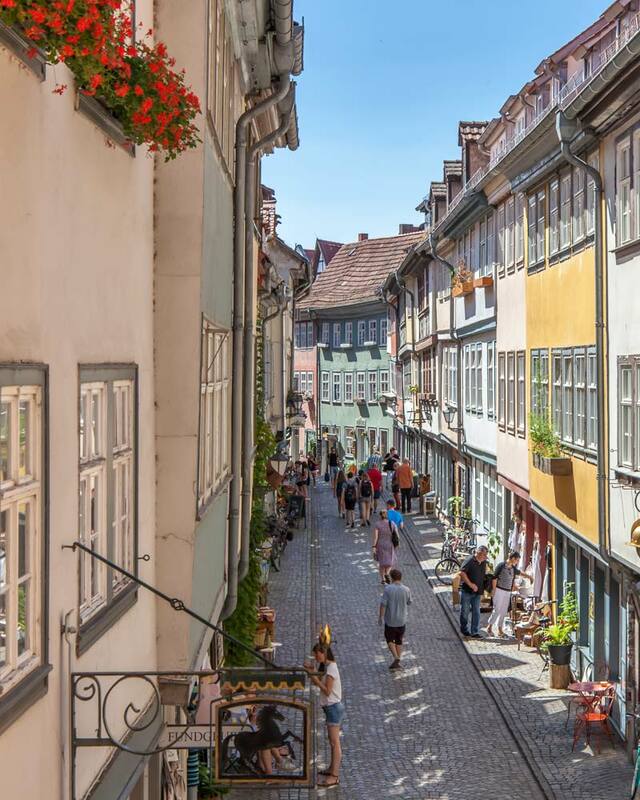 With a long history as a trading route and a well preserved old town, the cultural offerings in Erfurt are numerous and while some are obvious, many can be found down cute alleyways. 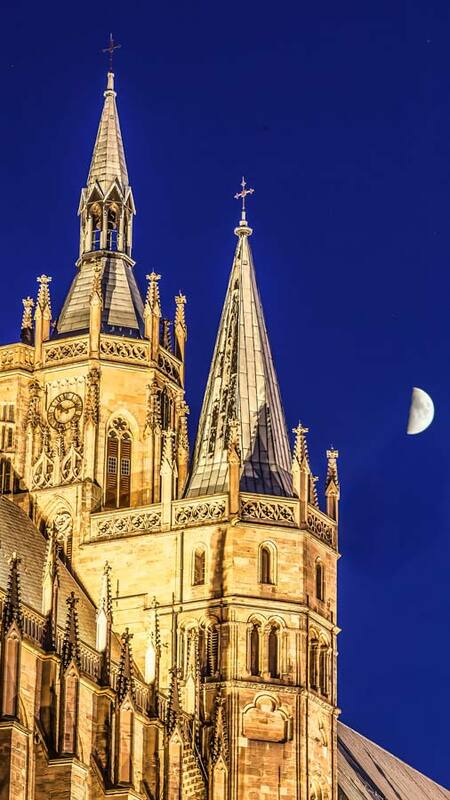 There are numerous churches and cathedrals throughout Erfurt with a couple being absolute must visits for their architecture. Start your visit at Cathedral Square where the Cathedral of St. Mary towers over the city. The late Gothic architecture is impressive and in the main tower lives the largest medieval free-swinging bell in the world. The high ceilings and beautiful stained glass windows are a reason to venture inside, as is the second church running alongside it which, until you get close, appears to all be the same building. The Preachers Church (Predigerkirche) is also a stunning example of the Gothic architecture in the city, the unique design with the pews for the choir hidden from the central seating area of the church and the unique choir balcony made this different to many other churches I’ve visited. Looking down on the cathedral square is Petersberg Citadel which offers a criss-cross of passageways underground and, given how maze-like they are, can only be visited on a guided tour. The Citadel has been used by various people and for multiple reasons over the year, but it was constructed in 1665. You can still see some vineyards on the fall from when the site was home to a Benedictine monastery. Nowadays inside some of the buildings are no longer in use, but a restaurant providing views over the city sits in a modern glass elevated building. Given the citadel is the only truly preserved baroque fortress in central Europe, it is worth taking the short hike up the hill to visit. The Old Synagogue of Erfurt is a bit of a hidden gem as the building had been built around and inside painted and decorated and used for entertainment. 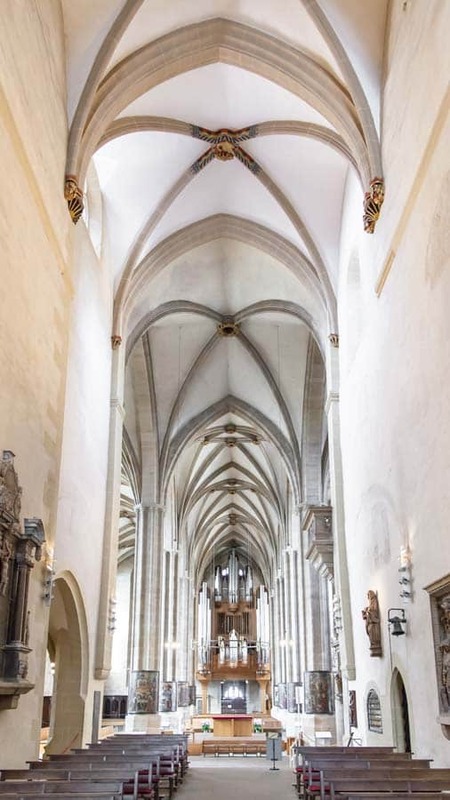 With only a handful of preserved medieval synagogues in Europe, this, coupled with the Erfurt Treasure, is currently being considered for inscription to the UNESCO list. The structure is impressive, and the museum inside gives an overview of life in the Middle Ages for the local Jewish community. Most notable in the basement you can find the Erfurt Treasure, a vast collection of coins, jewellery and other finds that was discovered during excavation work. One of the main tourists draws in the old town is the Merchants’ Bridge (Krämerbrücke) which is notable for a few reasons. Firstly, it is one of the very few bridges left in Europe which has inhabited buildings running through it. Given the original structure was constructed of wood, but later replaced by stone, the number of homes and stores along the bridge is impressive. At the top end of the bridge is St. Edigidus tower, part of the church that can be found on the second floor before climbing the tower for views down to the cobbled streets and rooftops across the city. Augustinian Monastery and Church is another of the many throughout the city, but famous for a slightly different reason. Martin Luther who led the reformation was a novice monk here for one year, though called it home for many more years. 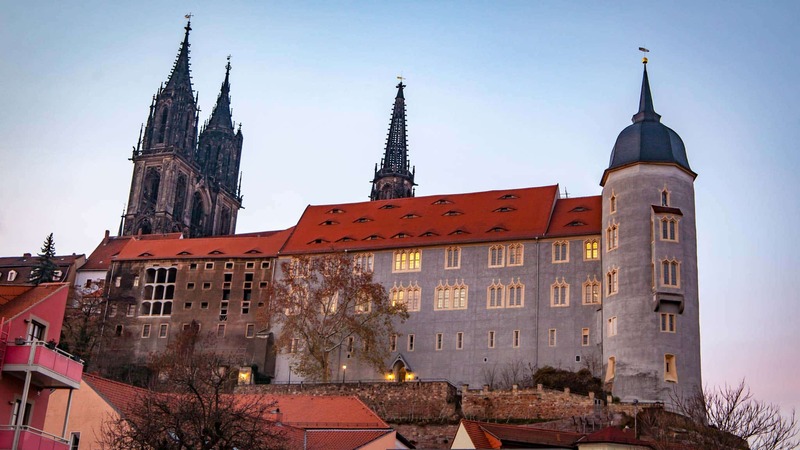 A museum and rooms dedicated to him can be found here as, since 1988, the monastery has essentially become a memorial to Luther. For those who aren’t interested in religious history, the courtyards and architecture are also worth swinging by for. 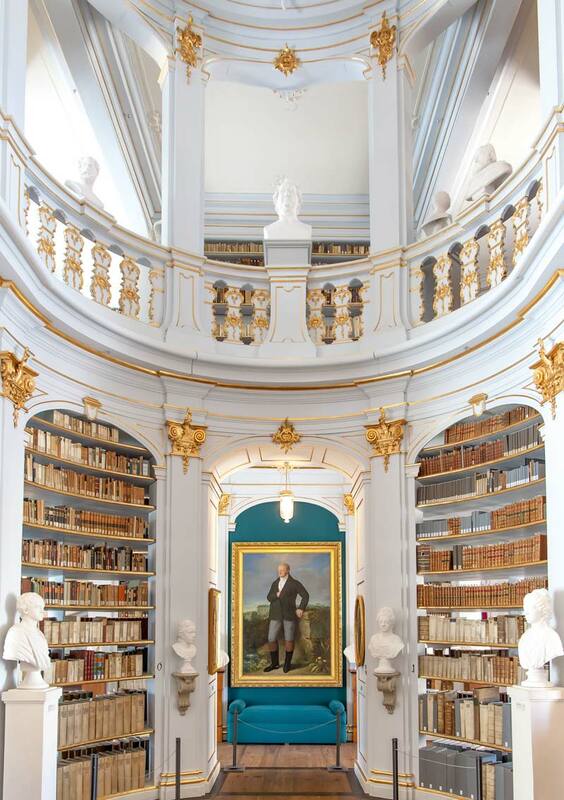 Weimar is surprising both in how delightful the city is, but also in the raft of cultural offerings it has ranging from more contemporary to classic. Home to two UNESCO world heritage complexes this is somewhere you could happily spend more than a day-trip soaking up. One of the two UNESCO listed complexes in Weimar is Bauhaus, for it’s contemporary contribution to arts and design. Founded in 1919 by Walter Gropius, to celebrate 100-years of Bauhaus a new museum dedicated to the design works will open in Weimar come 2019. The original studios and university can also be found in Weimar and explored, from the simplistic designs throughout the campus which all have a strong reason behind to attending an open display of the current students work. Bauhaus quickly made itself onto the international stage and has now expanded to additional universities in further cities. Just outside the central old town is Belvedere Palace a collection of grand buildings, a palace, various gardens and an orangery. 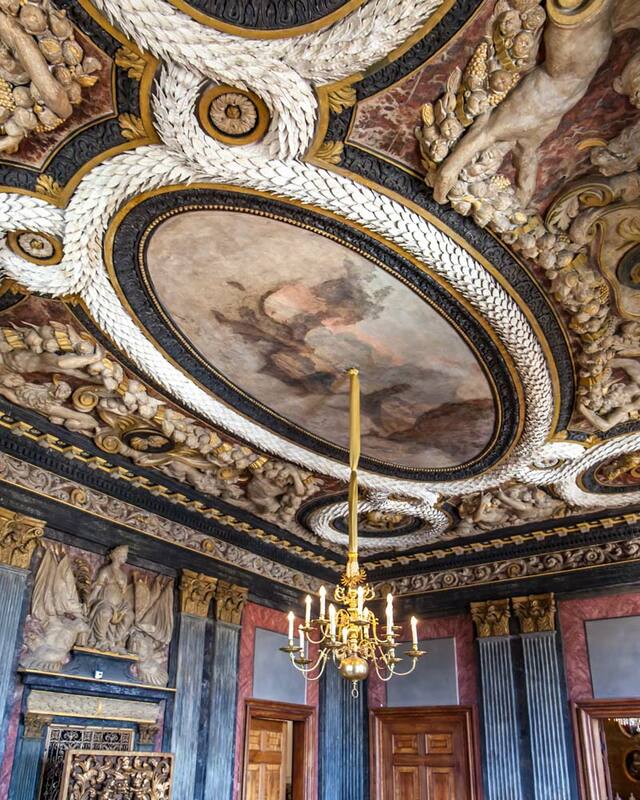 Not only limited to the impressive architecture which was constructed from 1724, but the rooms also host a unique collection of antique furniture, porcelain and art and is now also home to a school of Music at the University. Tragically this breathtaking library had a devastating fire in 2004 which saw much damage to both the collections and architecture. Founded in 1691 this is without a doubt one of the most famous libraries in the country and a library well worth travelling for. 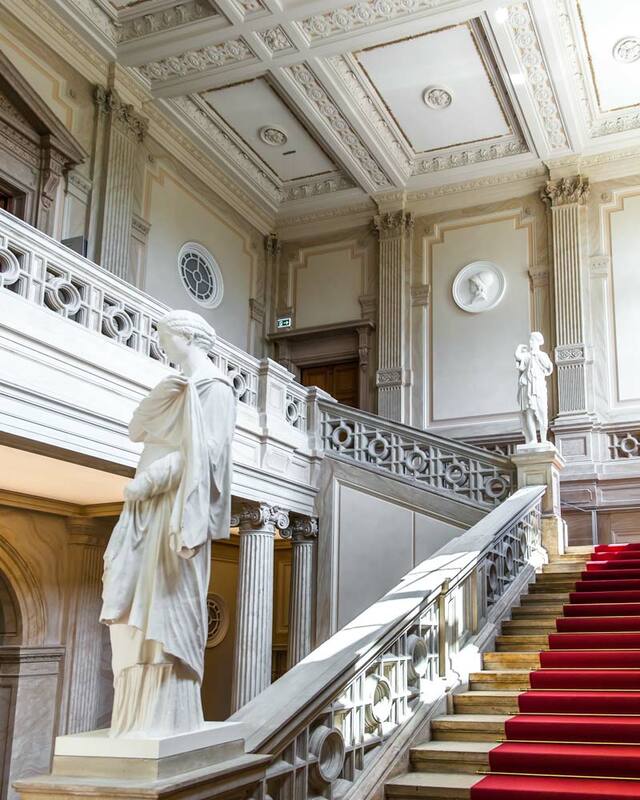 Home to over a million different books, manuscripts, maps, music and so much more, the main hall, the Rocco hall which is just breathtaking, attracts visitors from across the globe but with limited numbers allowed access daily, booking tickets in advance is a must. 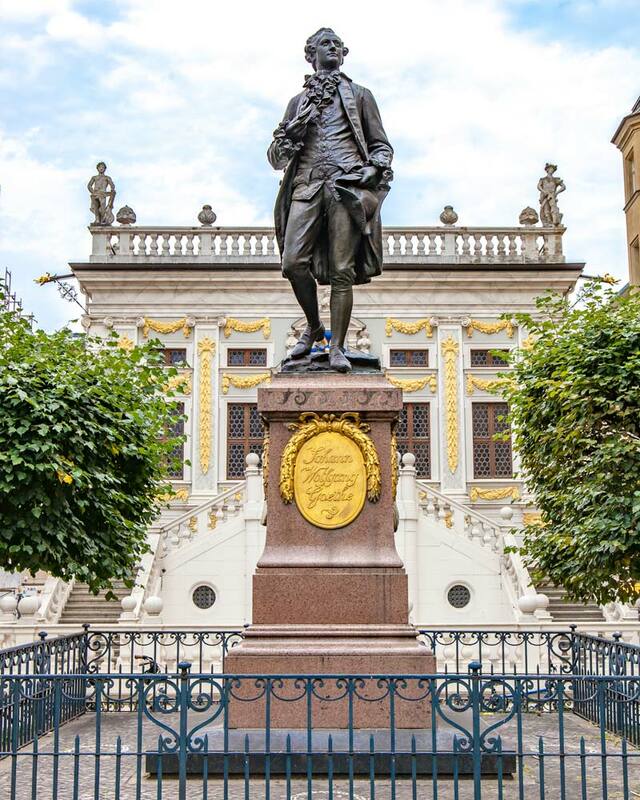 Leipzig has been the home of many things, from classical composers such as Bach to ever-growing historical trade fairs. It was also the starting point of the peaceful protests that eventually saw the wall to fall. Modern Leipzig though is a cocktail of uber-cool modern galleries and hangouts and the true classic culture that this region is famed for. You might need two days here to take it all in, depending on whether your interest lies in the old or new. St Nicholas Church is the largest in Leipzig, and inside you’ll find a unique style of decoration that is most unexpected for a church. But, it’s also famous for some fundamental historical reasons. The Prayers for peace started here every Monday from 1982 until they eventually spilt out onto the square and surrounding streets as the weekly attendance numbers grew. This was a critical part of the reunification of the country and the end of the GDR, and thus it’s a vital marking point for Germany as we know it now. A short stroll will take you to St. Thomas Church which is also known as Bach church as the composer worked and is now buried here after his body was moved here years later. The grand church which has been Roman and then Gothic in style now has a neo-Gothic interior and impressive stain glass windows which have been contributed from around the world. Leipzig has always been an important trading city, and this was cemented in 1913 when the Old Trade Fair exhibition began in the city. 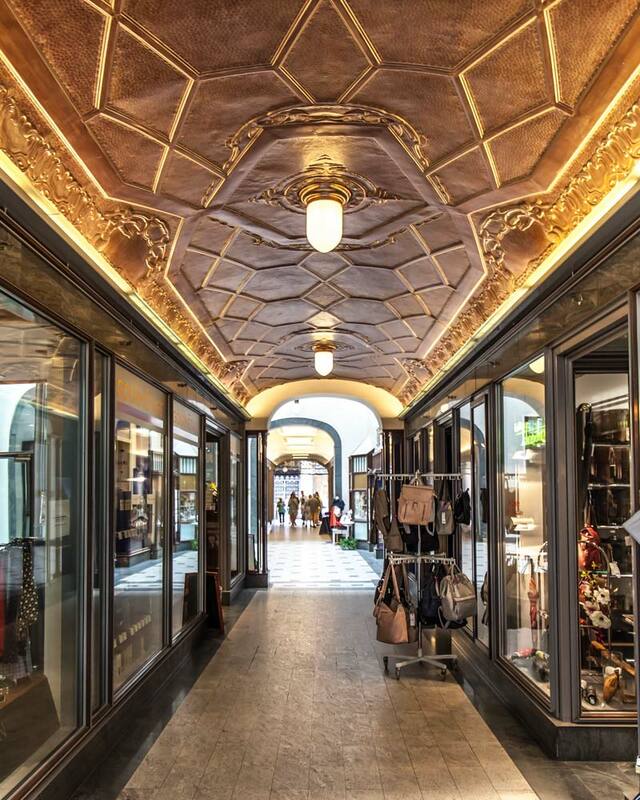 Walking through the old architecture and buildings of the city you’ll find many little passageways which had been added to the buildings and still play home to many local and boutique stores even these days. By the beginning of the 20th century, the Leipzig Trade Fair had become the most important in the world and till this day trade and commerce are an integral part of the city. In the west side of the city you’ll find the much more contemporary culture with street art, galleries and independent studios and stores selling their art. 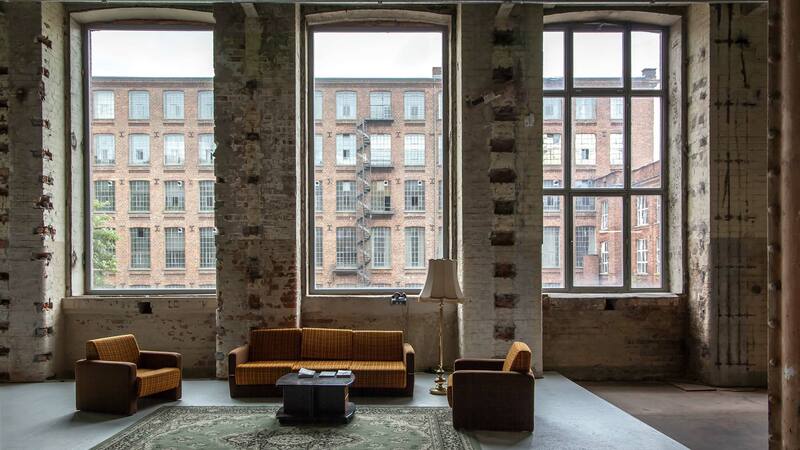 The Spinnerei Galleries are in an old cotton factory which was divided up into studios and gallery spaces and where you can take tours, or visit the stores to purchase modern art. Kunstkraftwerk is an even newer space which has revitalised abandoned buildings and now plays host to interactive modern art. 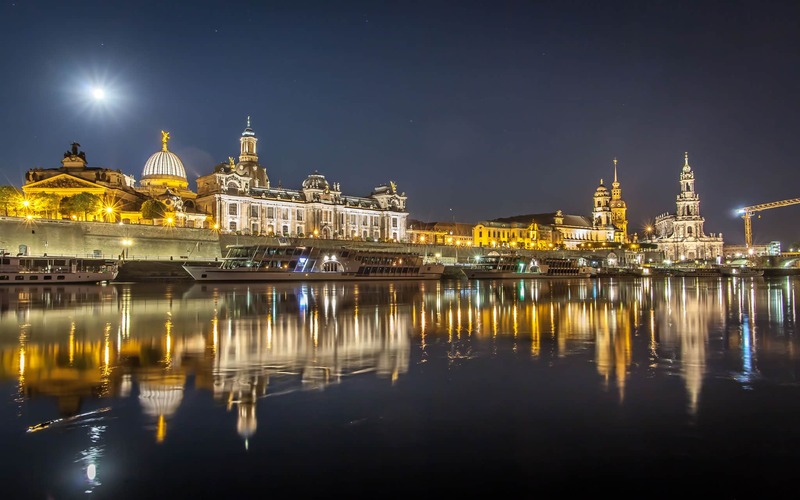 Dreamy Dresden, with its magnificent position along the Elbe River, is one of the most breathtaking cities in the region but sadly heavily destroyed during the war. It’s been lovingly re-built which creates an almost movie-like effect as ancient Baroque buildings are actually much younger than they seem. With so much to see, and experience here, the city oozes in culinary, classical and contemporary culture and you’ll be hard pressed to cover it all in a weekend visit. Along the banks of the Elbe lies a collection of castles including the most famous, Albrechtsberg Castle. These grand buildings with incredible views and well-manicured gardens came alive during my summer visit thanks to the annual event, Schlössernacht Dresden. The evening which takes place in the grounds of these castles sees musicians, performers, fireworks and plenty of fine wines and snacks lapped up by the residents all looking rather dapper. It was a magical evening as the sunset, and if you can time your visit to include this, I suggest you do. 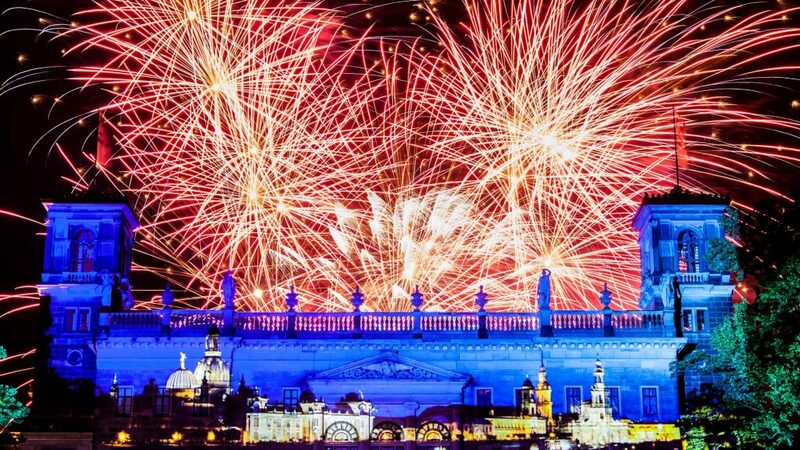 In a similar vein, many other events were happing throughout the city during my visit including Filmnächte am Elbufer Schaubudensomme, where movies are shown outside along the river before an evening of dancing and entertainment unfolds and the more modern performances in the new town. One of the first landmarks in the city, Dresden Cathedral is right in the heart of the historic city and was constructed from 1738. The restoration took two tries after WWII, and in the 20th-century the bridge linking it to the castle was finally restored. This truly beautiful building which sits alongside Zinger and has its home in the Theatre Square opened to the public in 1841 with a blend of Renaissance and classical styles. With a fire damaging the building heavily less than 20 years later, and then WWII seeing its near destruction, the building has gone through various reconstruction but yet is still regarded as one of Europes most spectacular opera houses. 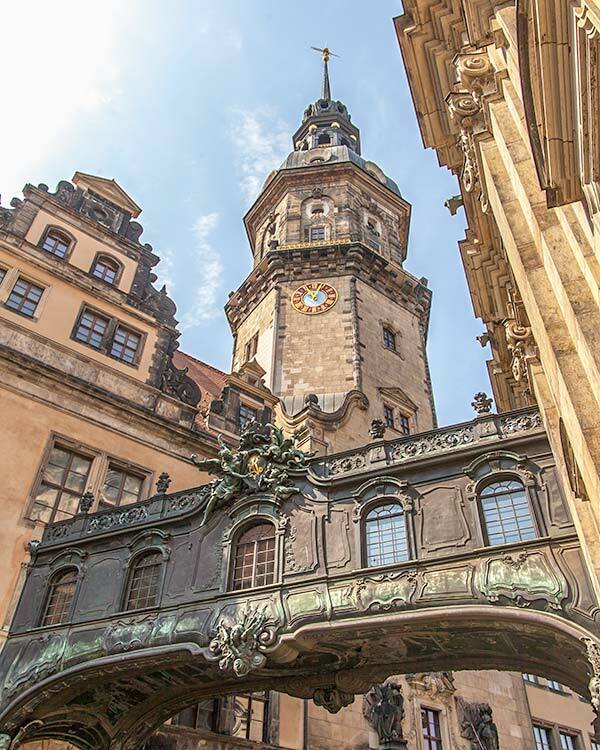 This insanely sized Baroque building which houses a giant courtyard, galleries, masterpieces and intricate architecture is one of the absolute must visit in Dresden. Even just strolling past the fountains inside the courtyard gives you an idea of the scale and number of views inside but if you venture into the gallery spaces you’ll be wowed even further by the world-famous collections. 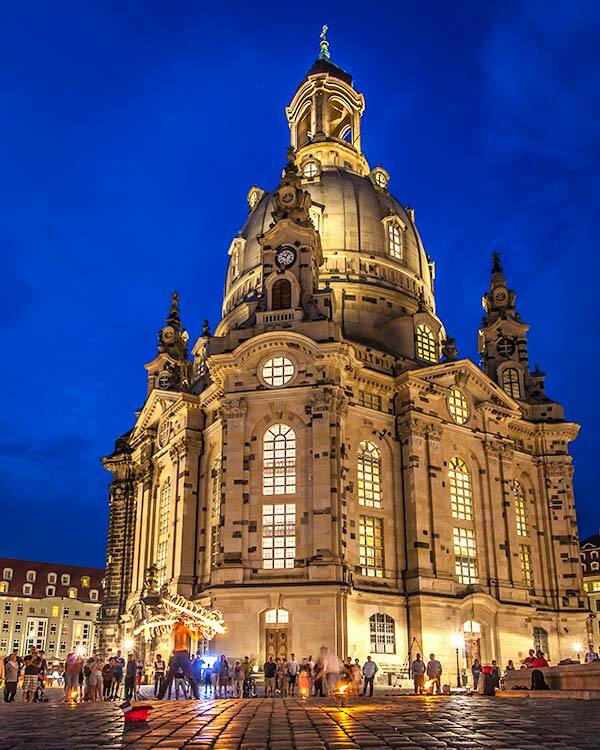 Perhaps now the most famous building in Dresden, The Frauenkirche with it’s immaculate white and gold interiors, huge dome and incredible views from the tower sits right in the heart of the main square and can be seen from all over the city. The Dome is perhaps the most famous part and was constructed initially in the 18th century before being damaged in WWII. Thankfully reconstruction took place as the church is probably one of the best pieces of architecture I visited in Germany and although there is a cost attached to see the dome and views from the tower, it’s money well spent in my opinion. 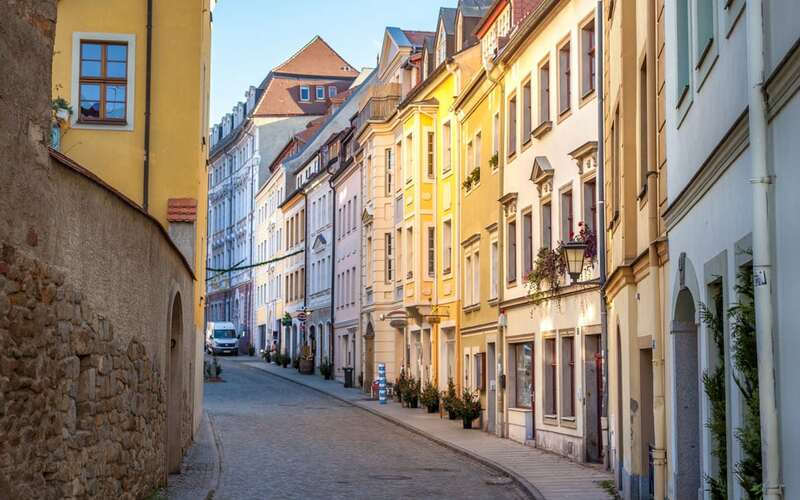 It’s also worth heading out of the city and along the river to Dresden-Loschwitz where some of the oldest, and prettiest houses in the region live. Here you can also get fantastic views of the Elbe and city by taking the historic funicular up the hill. After exploring the capital of the region, it’s time to head out and discover some more of Saxon Switzerland, the national parks and hidden gems of the Saxony region. Culture isn’t just reserved for cities here, and this would be the best time to higher a car if you really want the easiest and best experience without relying on public transport. 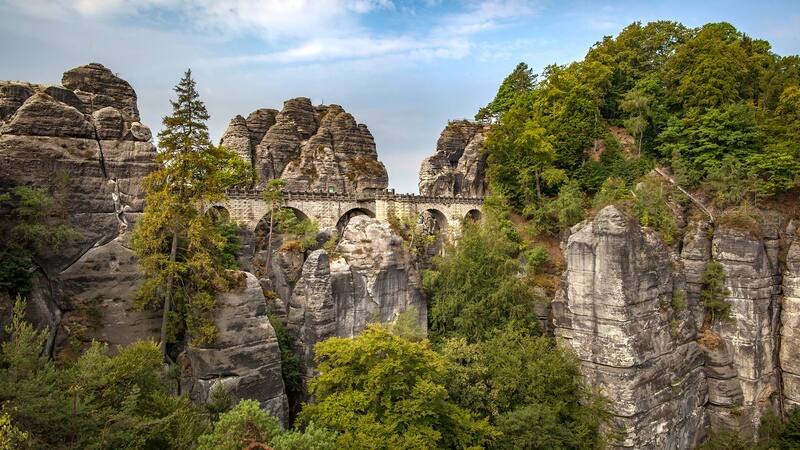 In the beautiful Saxon Switzerland national park, the rock formations of Bastei tower above everything. These incredible sandstone structures along the Elbe River are as captivating as the history behind them. The Bastei Bridge which links the formations together was initially constructed from wood before getting its current form in stone. Here you can not only enjoy incredible panoramic views but also visit the hollowed our holes from the old homes which used to sit on these rocks. 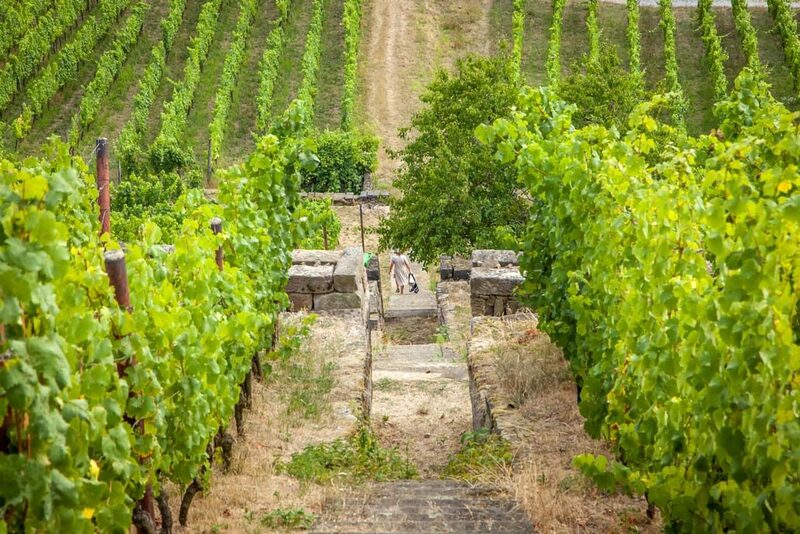 German wines might not be as famous as some of the neighbouring countries but while in Saxony you should undoubtedly sample some of the local offerings. As one of the smallest in Europe you’ll find some truly unique wines here as many growers have their grapes over multiple lots, and with around 3000 small growers here you can expect some very individually, small batch productions. I visited the Zimmerling vineyard where samplings and tours of the vines which climb up the hills from the river made for a great sunny afternoon experience. 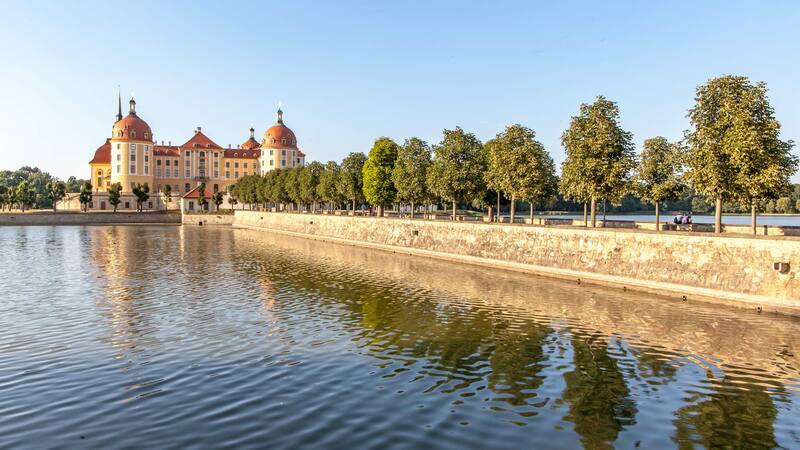 You can’t come to Germany and not overindulge in castles, and the Moritzburg Castle surrounded by waters and offering beautiful reflections are only a short drive from the city of Dresden. Designed by the same architect of Zwinger, the grand building is one of the most beautiful I visited and although I missed the chance to go inside I’ve heard a tour of the rooms is equally impressive. 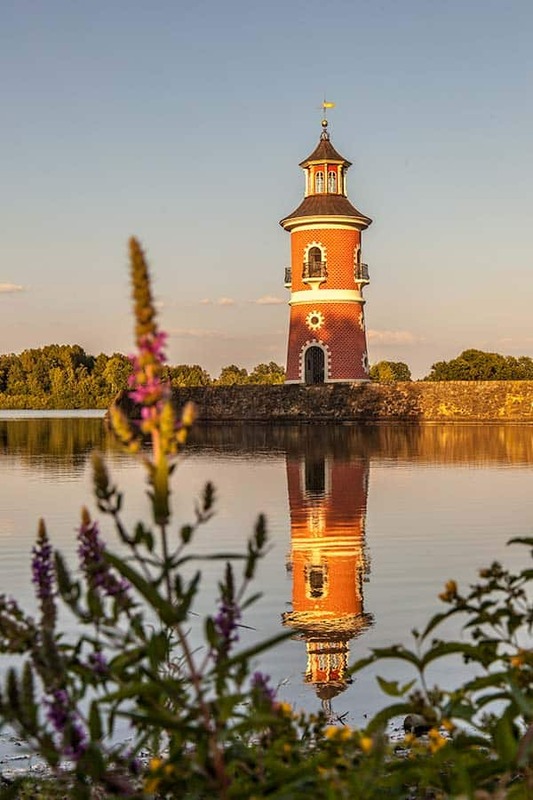 Nearby you can also find the smaller, but pink, Little Pheasant Castle and the small lighthouse that sits on the lake. The small but perfectly formed medieval city of Pirna sadly flooded in 2002 which saw lots of damage. 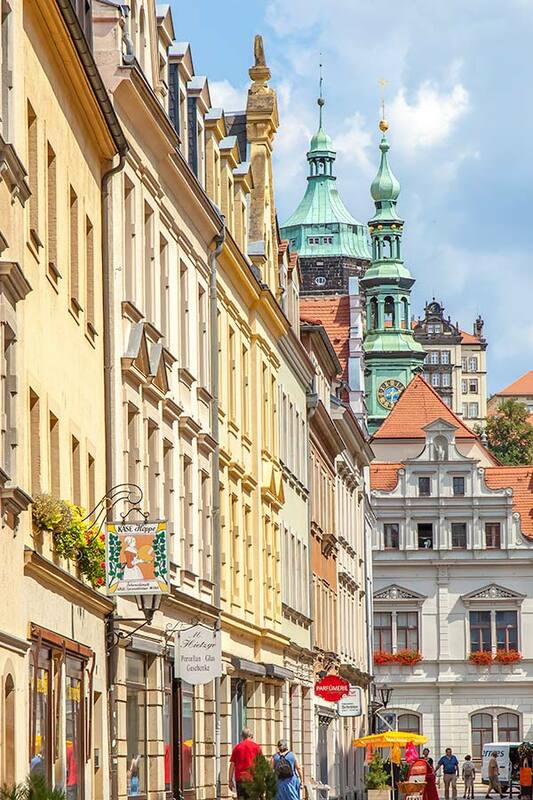 Fast forward to today, and the small streets of boutique stores, main medieval square and relaxed vibes alongside the Elbe make this a relaxing place to visit either by car or taking a boat from Dresden. The town of Meissen was one of my favourite places to visit in the whole of Saxony. 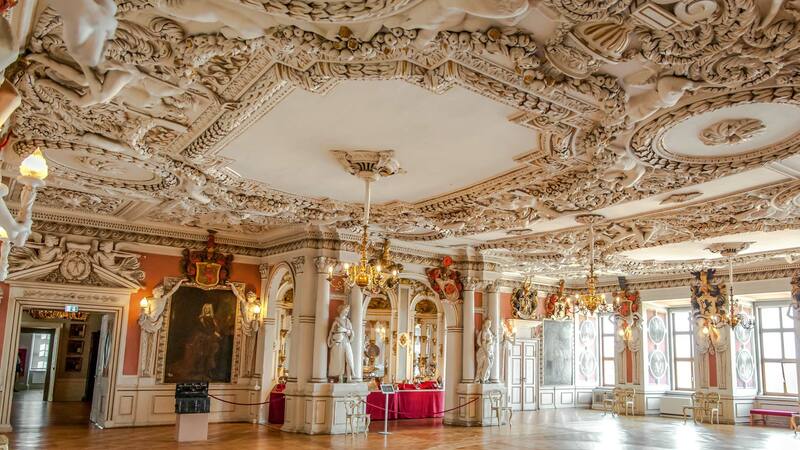 Famed for its porcelain production, the first thing that will strike you when driving towards the town is the impressive and unmissable 15th-century Albrechtsburg. This castle-come-church has an enviable position perched on a hill overlooking the town and is well worth visiting. A walk up to the castle will provide you with a dreamy view across the rooftops of the town. Be sure to keep an eye out for the artwork painted onto the sides of some of the buildings. 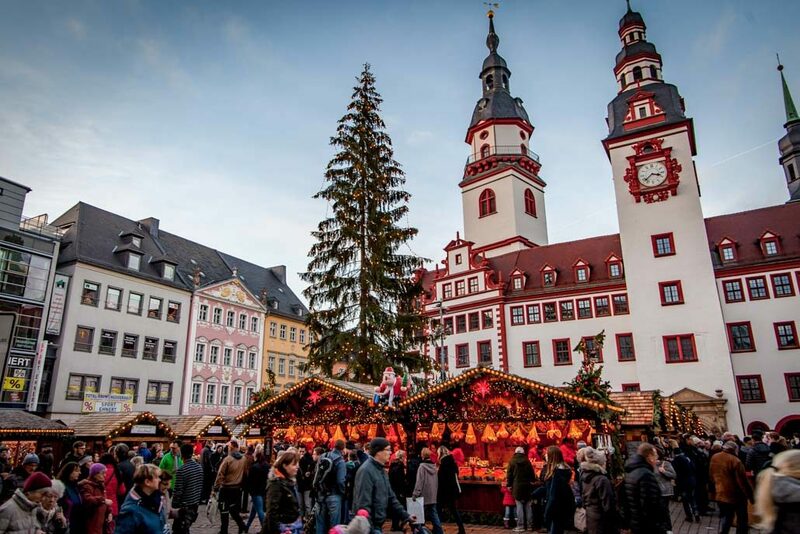 The Christmas market itself here is also adorable, and the hall alongside the market, with its numerous windows all sporting numbers, is transformed into a life-size advent calendar for the weeks leading up to Christmas. 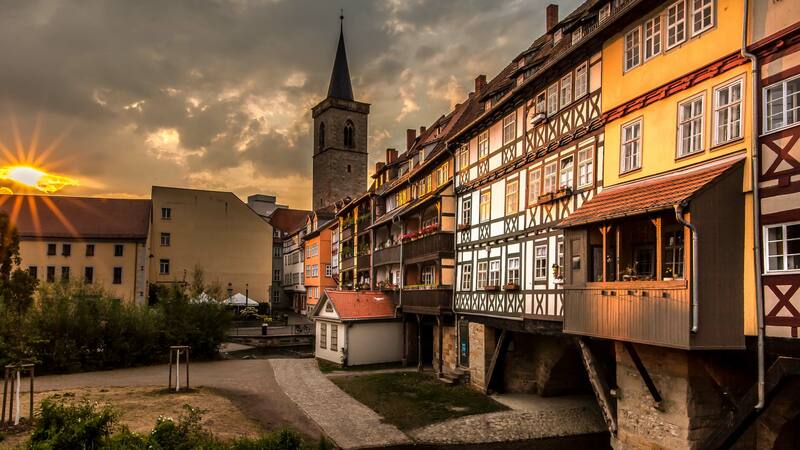 Bautzen is a romantic city, and it offers up some fascinating history. The still mirror-like river, imposing castle turrets and walls, and the intriguing church is another reasons to visit. The first thing you notice about the church from the outside is the peculiar shape it holds having been built at an angle. Inside though is where you’ll find something very different. 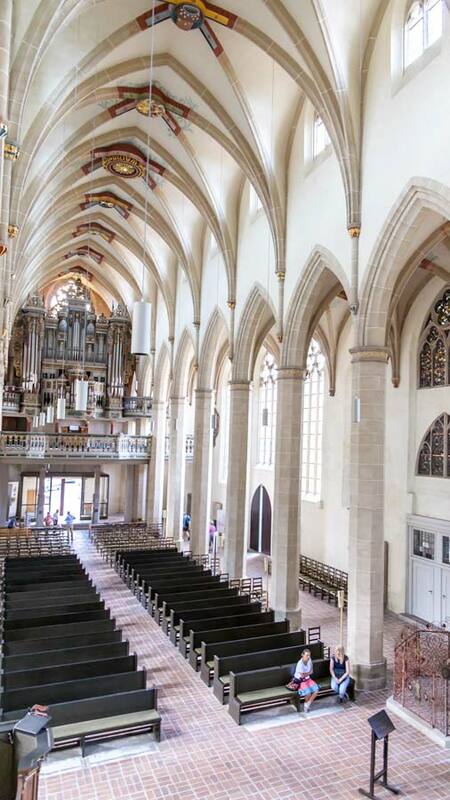 The Cathedral of St Peter is one of the oldest churches in Germany and is home to two faiths, which makes the interior so fascinating as in one hall you can physically see very little divide between the two places of worship inside. The mix of both a Gothic and Baroque interior also add to making this one of the most unique churches in Europe. One of the official minority languages of German is Sorbian, and here in Bautzen is the first time I got to hear it being spoken. 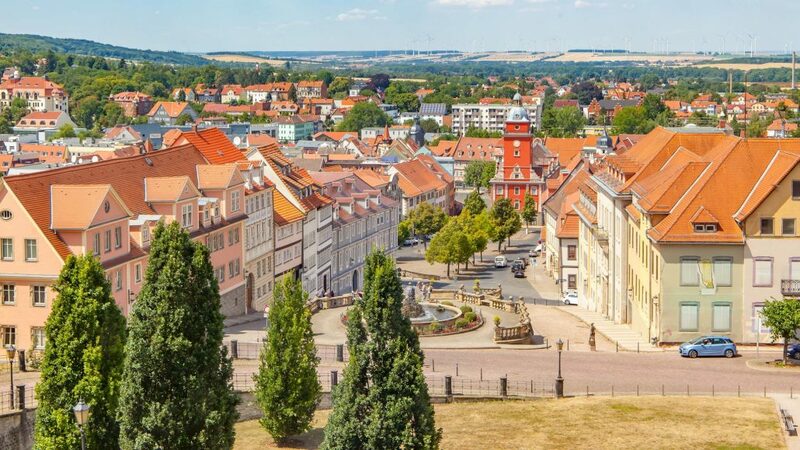 Lusatia and Bautzen is the homeland of the West Slavic ethnic group who also reside in Poland and the Czech Republic. Here in Bautzen I really enjoyed the chance to visit a traditional restaurant and dine on the official wedding dinner of the Sorbs, with a focus on meat and potatoes, as well as learn a little more about their culture and history from the local museum. I don’t think there is anywhere you’ll feel more like Christmas year-round than in Seiffen and the Ore Mountains. 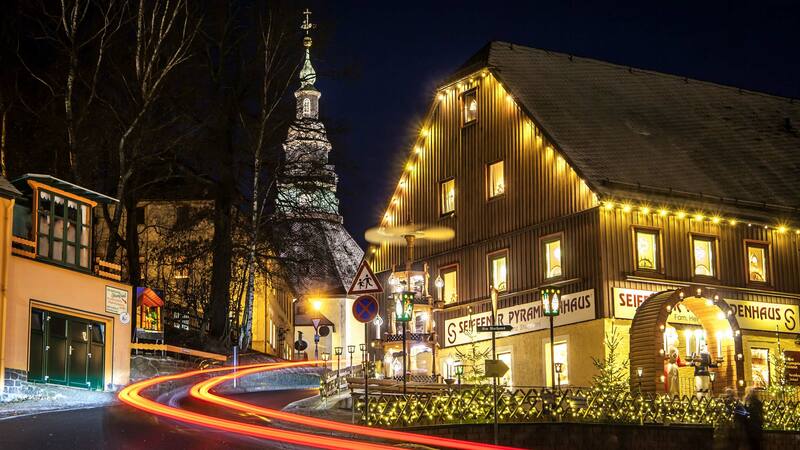 Throughout the mountains, you’ll find countless old miners towns where traditional wooden tours, feasts and underground concerts are performed while in Seiffen itself, production of many of the most Christmasy gifts and toys is underway all year round. The famed church here, reconstructed numerous times is a draw, but for me,x the real magic lays in the festive vibes you’ll encounter here, and if you find yourself in Saxony during December, a visit to Seiffen is a must! Chemnitz is the third largest city in Saxony, and when I visited, its Christmas Markets and festive parades are in full swing. 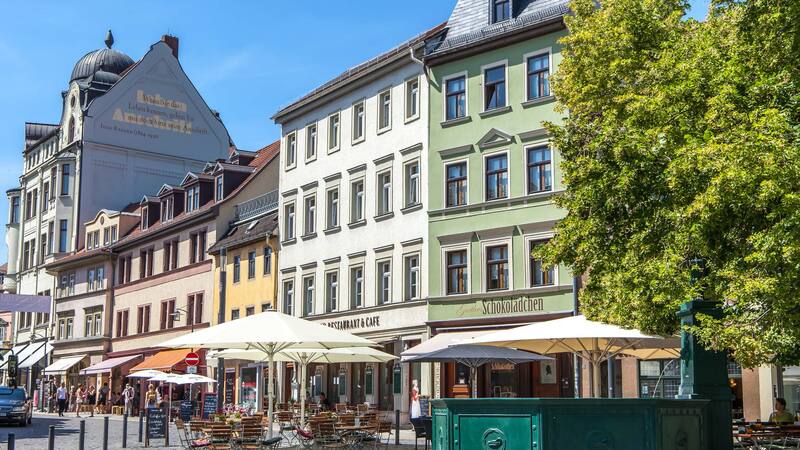 Unlike Dresden or Leipzig through, Chemnitz boasts a very different vibe. While the picture above may show the ‘old’ part of the city, there is very little of old Chemnitz left, and it boasts itself on being the ‘modern city’. From the glowing LED lights that surround the train station to the modern trams and shopping malls, if you are driving around the region, especially to the mountains, this is a grand place to stop off for the night or enjoy some fantastic cuisine. So much old town charm! 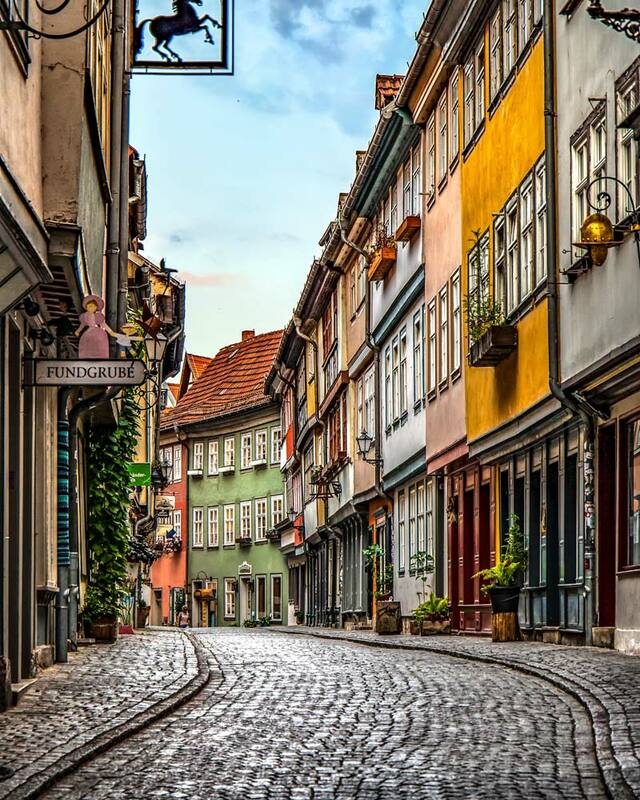 I love the cobblestones and the traditional German houses. So beautiful! It is really good place . I want to be a good torist so I wish i will go SAPER OPERA , With a fire damaging the building heavily less than 20 years later, and then WWII seeing its near destruction, the building has gone through various reconstruction but yet is still regarded as one of Europes most spectacular opera houses.